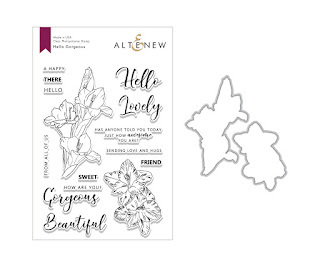 Altenew Antique Silver Embossing powder. 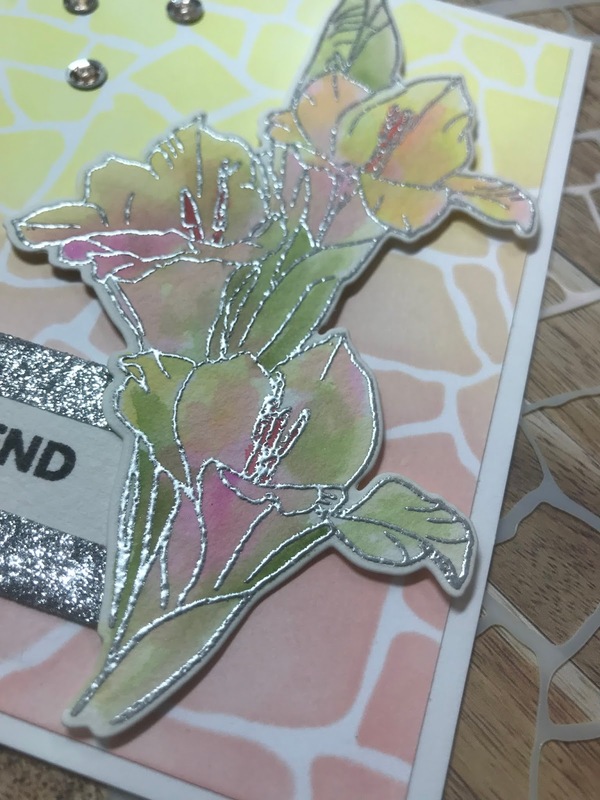 Using Altenew re-inkers, I watercolored the flowers. Stamping the panel with Lavender Fields ink and using the Rustic Linen Stamp, I then die cut the panel using the Pocket Banner Die. When stamping the sentiment I wanted it to be silver so I embossed it on the pocket panel. I found that it disappeared on the background so I outlined it with my Lavender Fields Artist Marker. 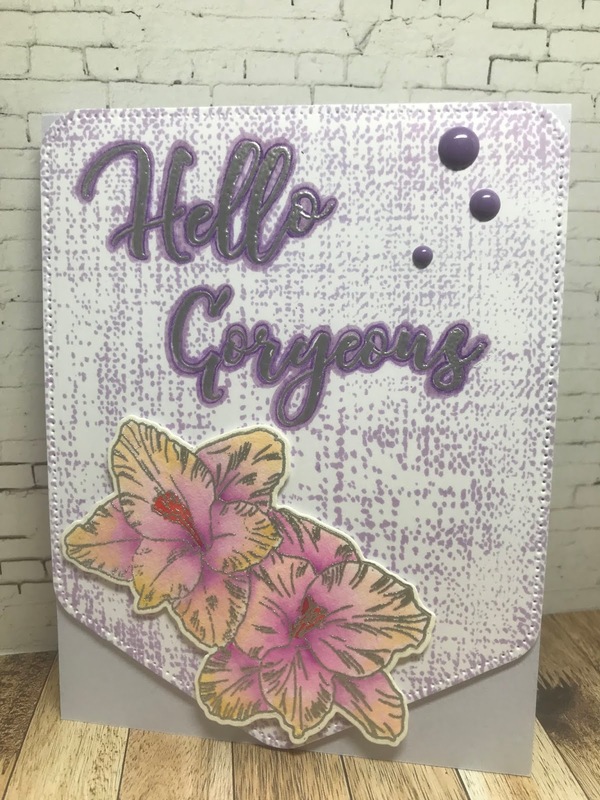 For the next card I selected the other floral image from the Hello Gorgeous set. 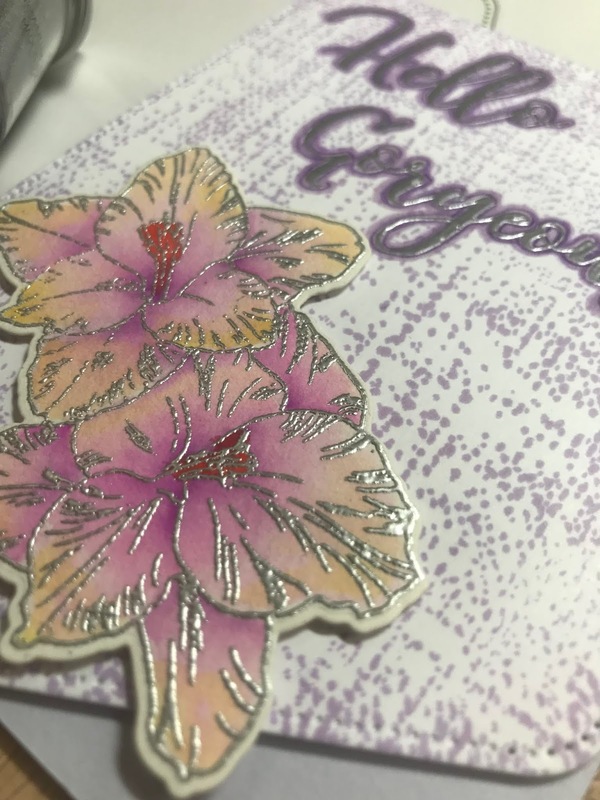 Stamping (on watercolor paper) and embossing the image with Altenew Antique Silver powder, then die cutting the image. 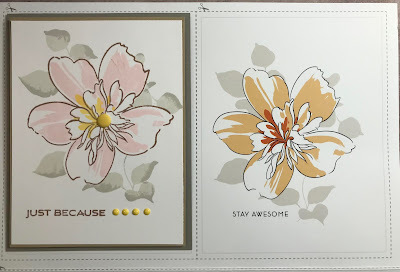 Once again using Altenew re-inkers I colored the image. 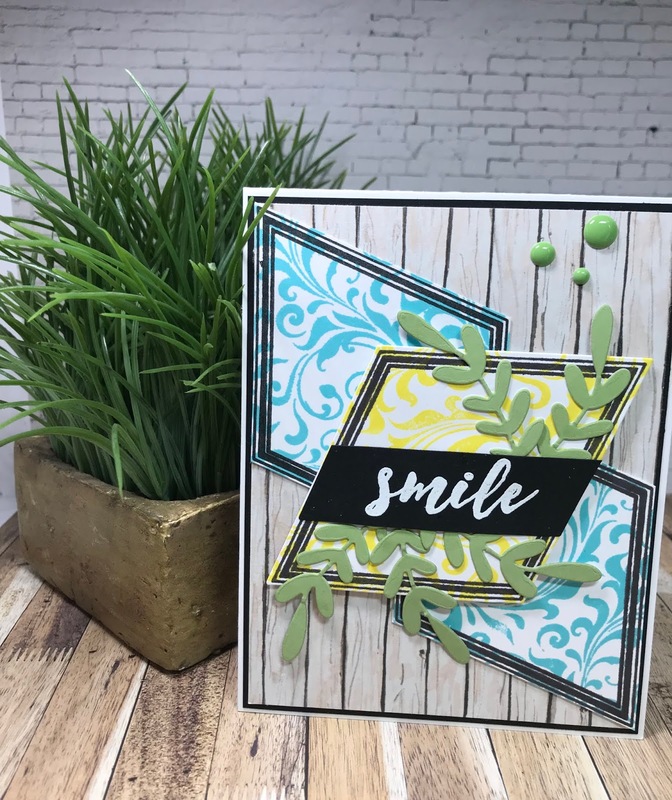 My background was created by using Altenew Crisp Die Inks and the Stone Wall Stencil. 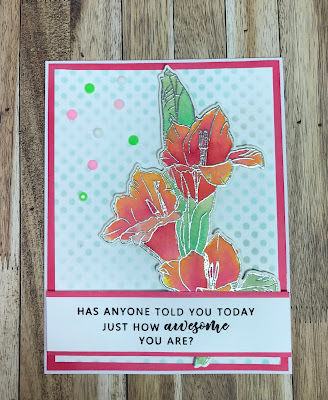 Selecting a simple sentiment, the card was finished off with Altenew Silver Glitter tape for an accent. 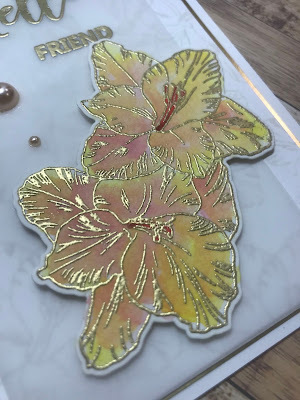 My final card, I once again used watercolor paper and stamped the floral image and embossed using Altenew Antique Gold powder. I also stamped the sentiment on Vellum using the same embossing powder. 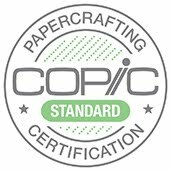 *note* be sure to pre-heat your heat gun prior to embossing and be very careful when embossing on the vellum, as it will warp easily. I love to use my floral stamps to create a background paper and this card highlights that process. I usually select Altenew Morning Frost Crisp Ink for this type of background. After creating the background floral panel, I layered the vellum panel on it and secured it on the backside. Now I layered this over a gold panel and adhered it the the card front. I hope these three cards give you a little more inspiration from this latest release. 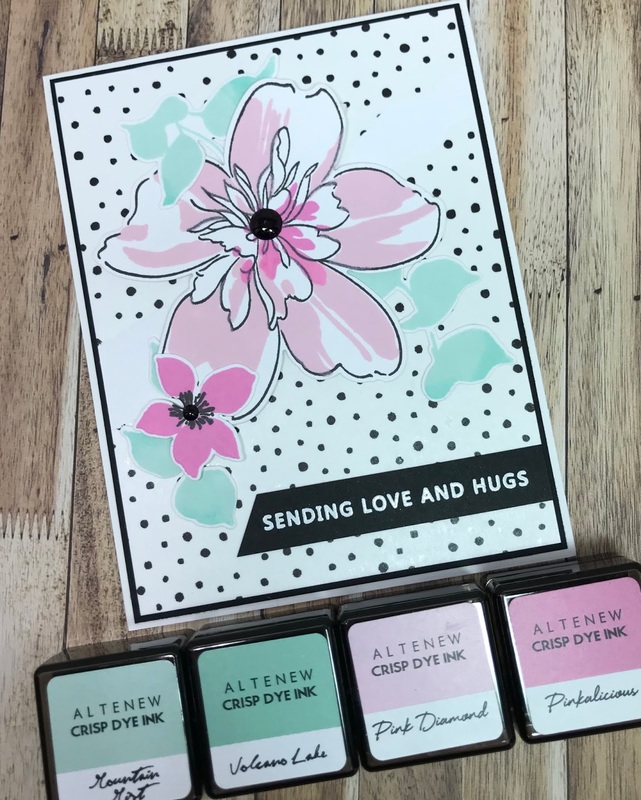 I have truly loved being a part of this Altenew release. 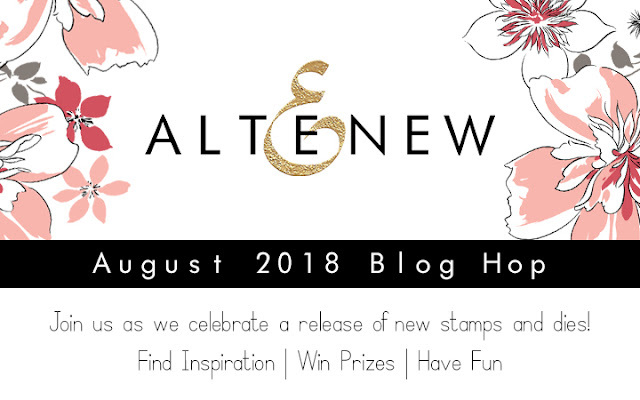 Welcome to the August 2018 Release and Blog Hop, you should have arrived here from visiting Lilith's Eeckels blog. I absolutely love the products in this months release and have 6 projects to share with you today. 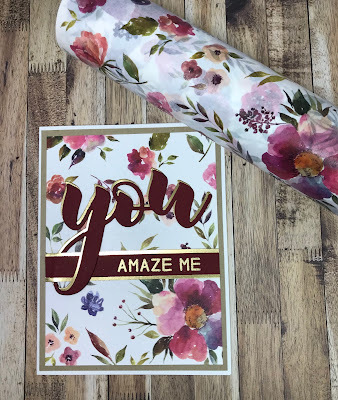 I love the Floral Flurries Washi Tape and it matched my paper choices perfectly! 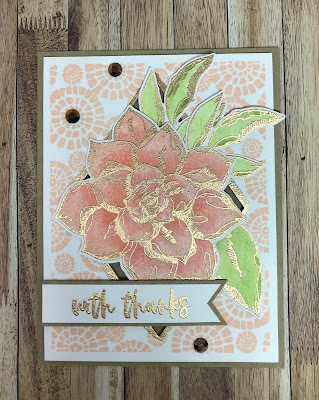 I cut the 'you' out of Altenew Apple Red and Gold Foil Cardstock then layered them to create a shadow. Using a Classic Crest Solar White card base, the washi tape is adhered to a panel then layered on a kraft panel. I stamped the sentiment with Altenew Antique Gold embossing powder and tucked it through the loop of the 'y'. Altenew Jet Black cardstock and then spraying a little Altenew Ocean Waves Ink Spray on the paper. Enamel Dots are from the New Day Kit. 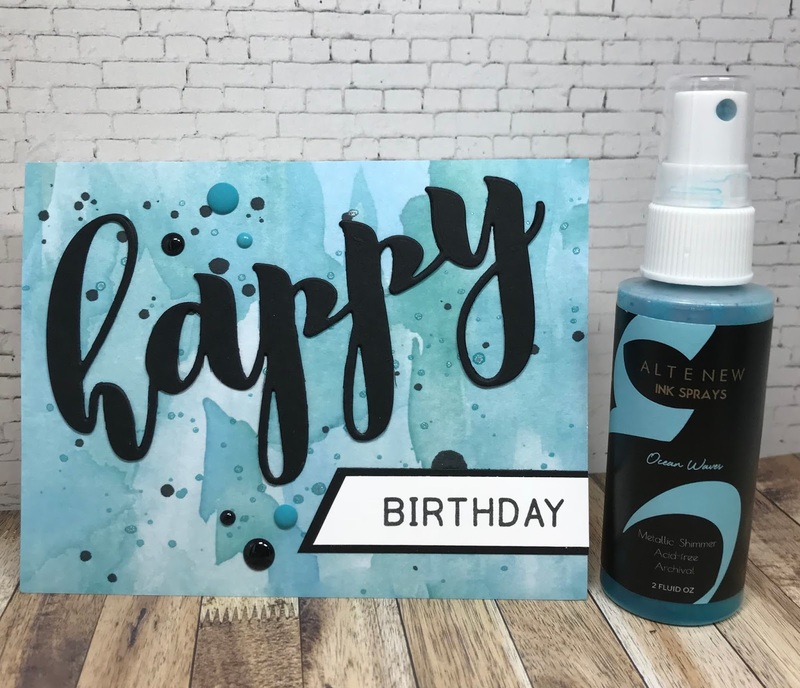 Adding a BIRTHDAY sentiment finishes off the card. This card again is very easy. 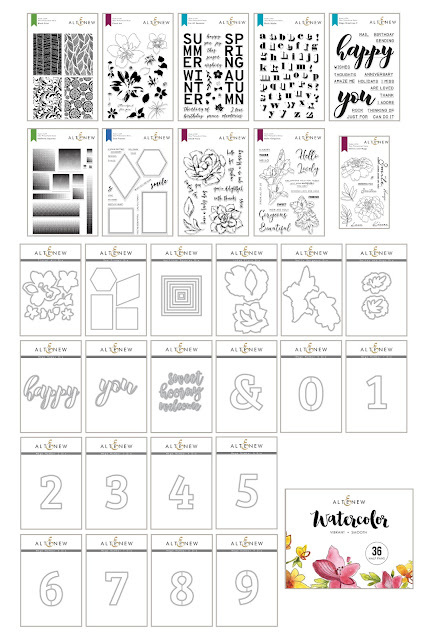 I selected the Altenew Dotted Washi Tape and tore a section into 2 pieces, layering those pieces on the upper left edge and lower right edge of the card panel. I left a small section in the middle to show the torn edge and the white panel underneath. Stamping the floral pattern on Classic Crest Solar White paper with Altenew Inks. 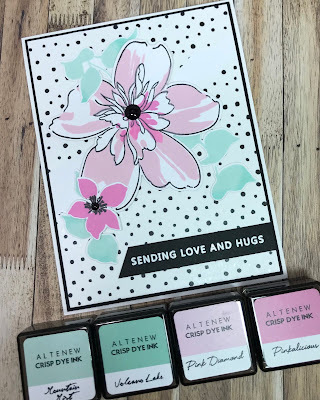 Pink Diamond, Pinkalicious, Mountain Mist, Volcano Lake and Jet Black inks were used. 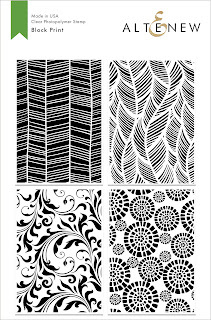 When I saw the Block Print Stamp set I knew that I wanted to use it with the Geo Frames Dies and Geo Frames Stamps. Stamping one of the patterns on three shapes using two colors. 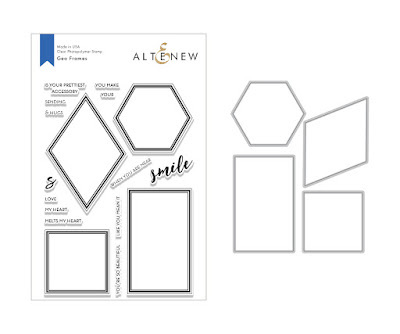 I choose the Rhombus/Parallelogram shape to stamp and die cut. Altenew 6 X 6 Reflections paper pad has a cool wood look paper that worked perfectly for the card front. 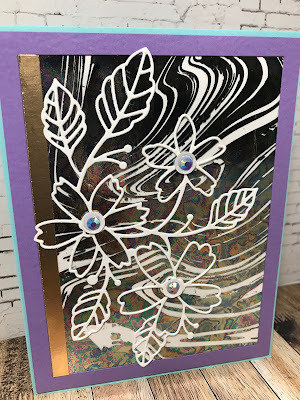 I layered it over Jet Black cardstock and used a Classic Crest Solar White card base. 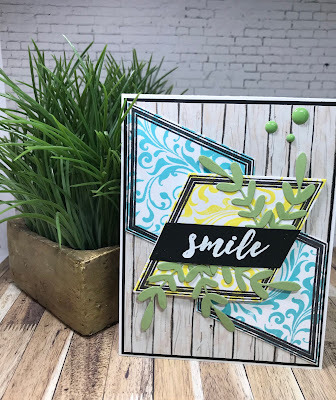 The 'smile' sentiment was embossed with Altenew White Embossing Powder on Jet Black paper. 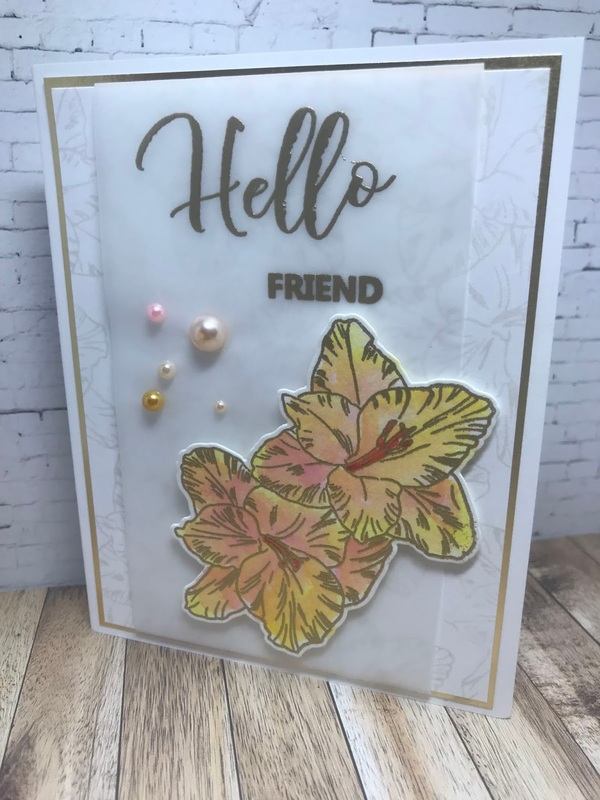 Leaves were cut from Forest Glades cardstock the Create-A-Wreath Die set. 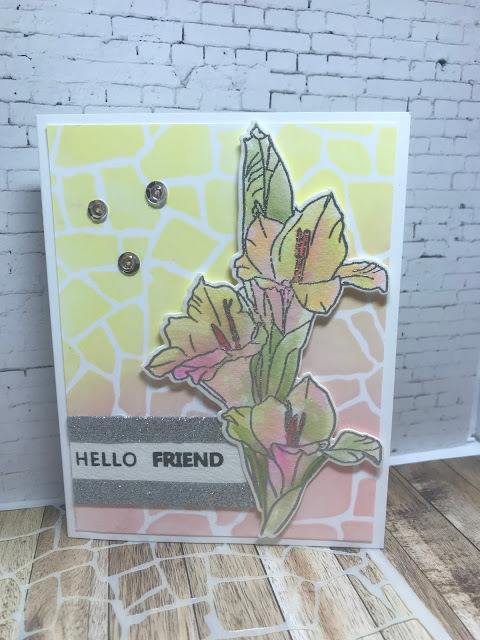 Wanting some dimension on this next card, I used a pattern from the new Block Print Stamp set to create a background, Altenew Peach Perfect Ink was used. Because of the size on the stamp I needed to stamp the pattern 2 times to cover the panel. 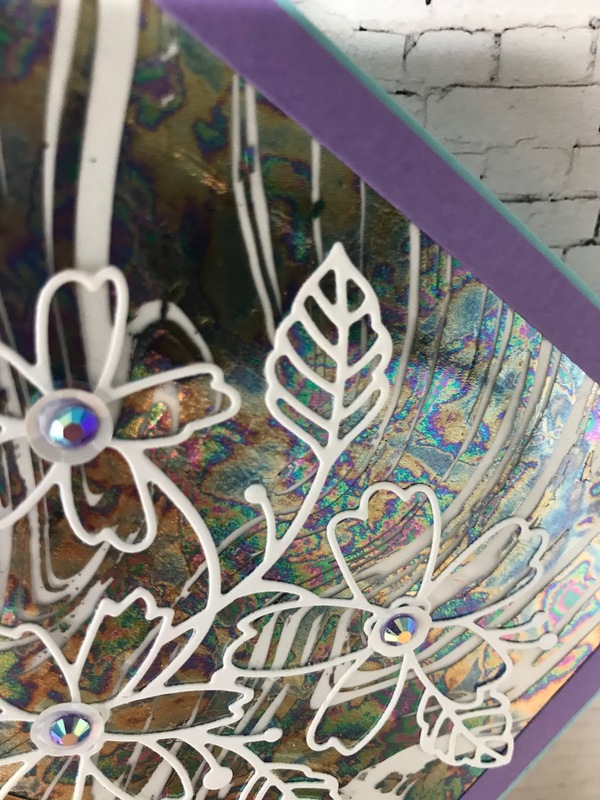 To create interest I used the Rhombus/Parallelogram shape from the Geo Frames Die and die-cut the center of the panel. Rose Gold Embossing powder was added around the opening. 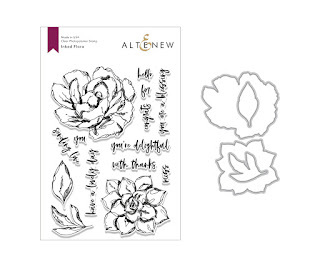 The Inked Floral image and sentiment were also embossed with Rose Gold Embossing powder. 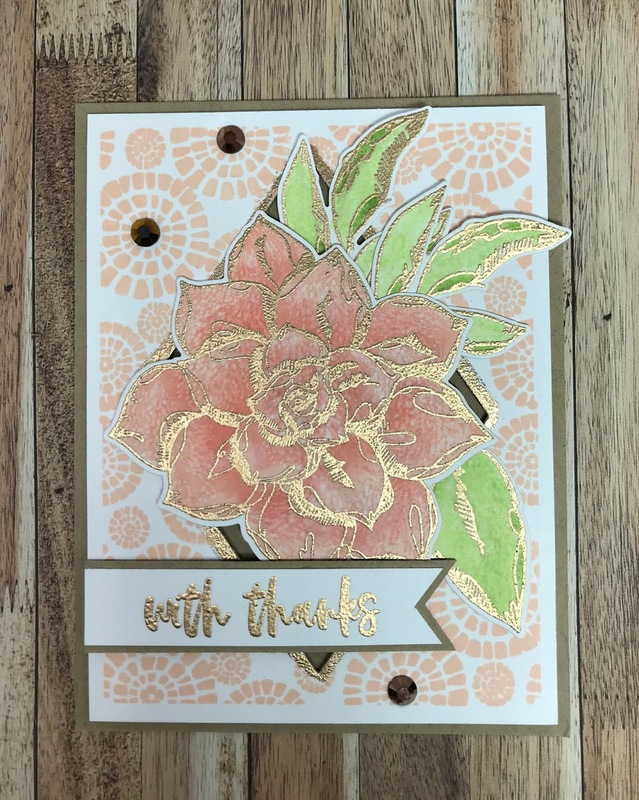 I colored the flower and leaves using Altenew Artist markers Frayed Leaf, Forrest Glades, Peach Perfect, Frosty Pink. Using Alcohol and a small peace of cloth, I gently textured the flower. 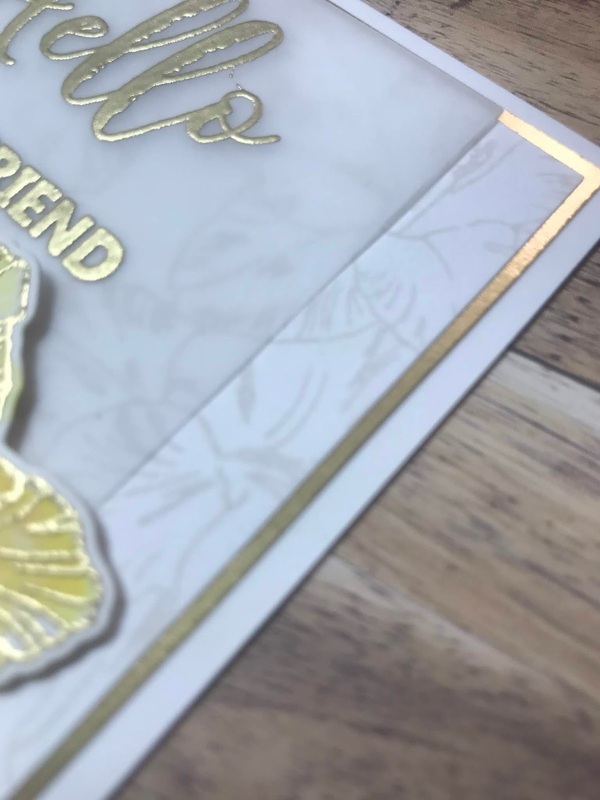 Using foam tape to pop-up the image in the center of card plus placing a few Lucy's Gems for accents. 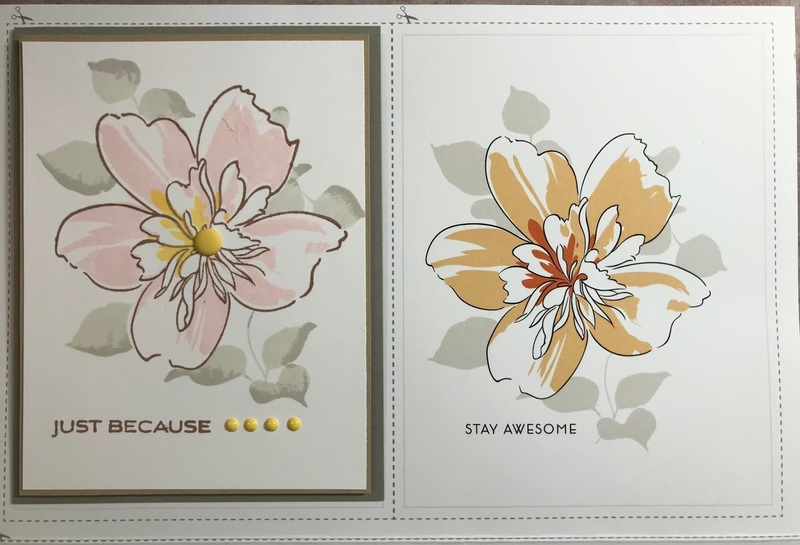 Starting with Classic Crest Solar White cardstock and using Altenew Aqualicious and Evening Gray ink, I inked up a background using the Altenew Feeling Dotty Stencil. 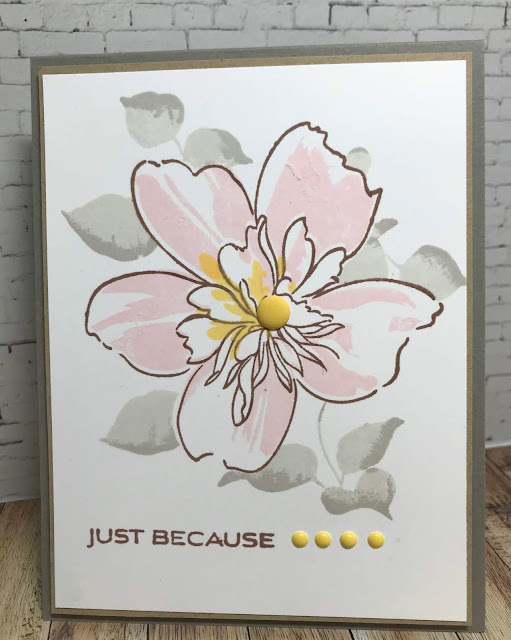 I stamped and embossed the floral image with Altenew Antique Silver powder on watercolor paper. With Altenew inks I watercolored the flower. Fresh Lemon, Cotton Candy, Coral Bliss, Heart Beat, Rubellite, Frayed Leaf, and Sweet Leaf inks were used. Assembling the card with foam tape under the flower and the sentiment strip. Altenew Jet Black ink was used for the sentiment. 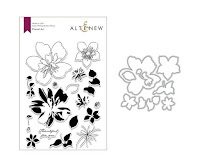 Altenew is giving away a $50 gift certificate to SIX lucky winners! by Wednesday, August 22, 2018 for a chance to win. 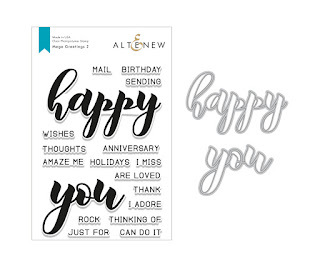 Six winners will be announced on the Altenew blogs on 8/26/2018. Thanks for visiting today and check back for more August 2018 release inspiration. Well, I’ve had a busy summer as I’m sure most of you have. I took a break since I have been traveling and also working in my garden. This summer I've taken classes from Gina and Rina K, traveled to Junkiefest 2018 and Stampaway 2018 then started my canning. Pickles, Salsa and Pesto are my three main items that keeps me busy. My husband has started helping me with the process which has been very nice. The prep work takes the longest and its always great to have those extra hands to lift the heavy canners. 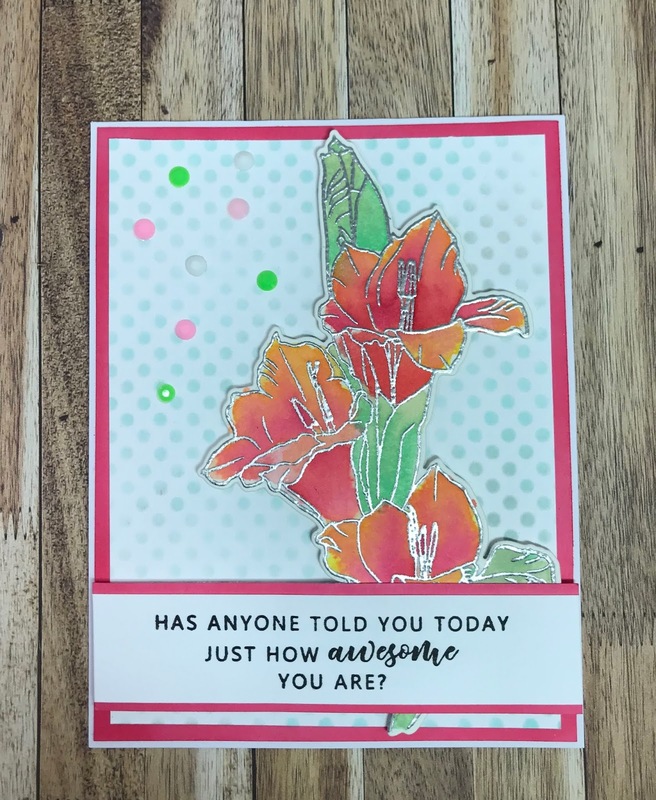 Today I'm back in my craftroom and I want to share a couple of cards I made for special occasions. The first one was for our pastors daughter who got married a few weeks ago. 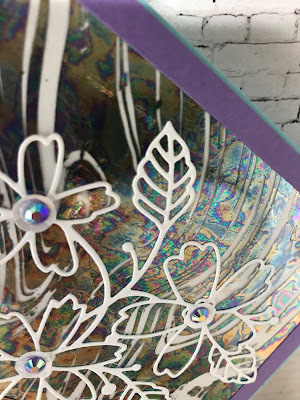 While attending Junkiefest I had the opportunity to play with the new Brutus Monroe Foilmates and luscious Tide Pool Deco Foil from Thermoweb. This card was so very hard to photograph. Here’s a closer look at the foil. I used Tide Pool foil on the marble foilmates paper. The next card I made for my sister's birthday. 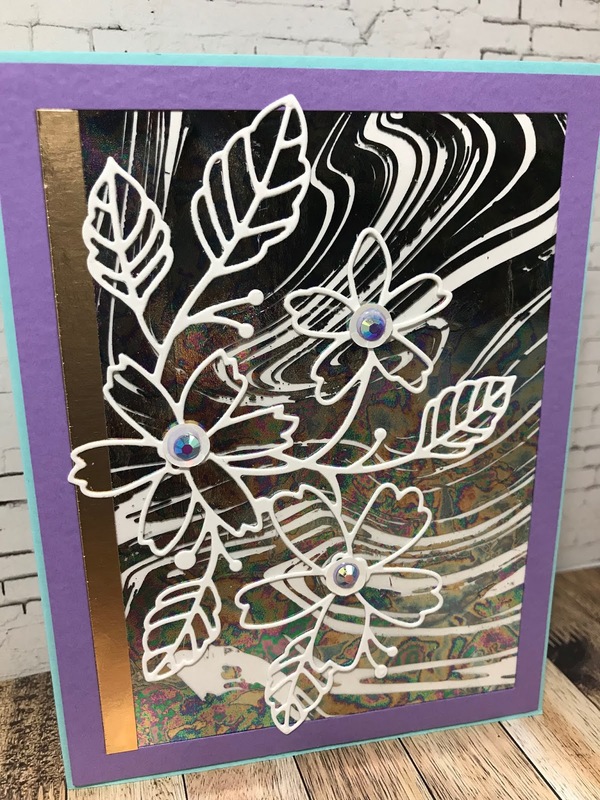 I used the same foilmates and Tide Pool foil then added a copper accent strip along with highlighting the purple and teal colors that pop out of the foil. I also added the Fresh Picked Flowers diecut from Memory Box, along with some Lucy's Gems for accent. 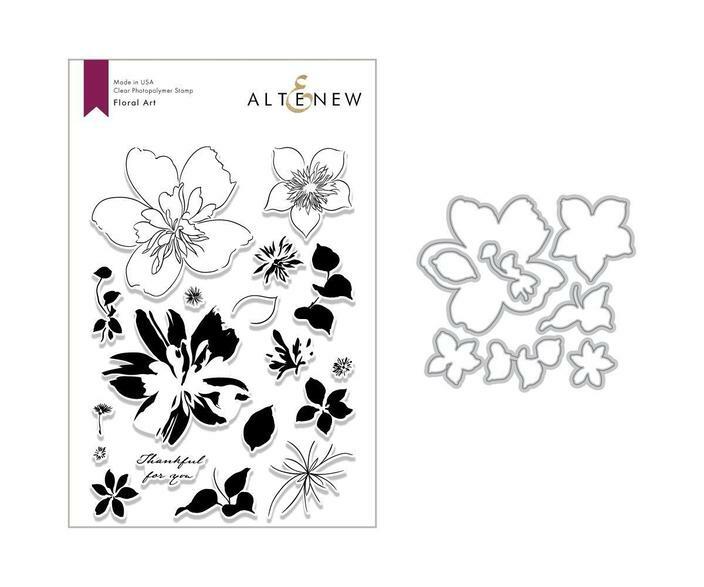 Thanks for stopping by today and check back later this week for the August Altenew release. I'm excited to be a part of the blog hop this month.